IPN develops and distributes a modular IoT platform which represents the whole workflow for the development and application of models to predict machine states, process stability and product quality. Every process step from data collection to data pre-processing to the development and application of prediction models is reflected. Our experience shows that only a small part of our customers really need the full platform functionality right from the beginning. Most of our customers are at the very beginning of their journey to the world of IoT and “data-based prediction models”. Most companies are at a point at which they want to start collecting data in a structured and quality assured way. These companies need the tools to collect data, ensure its quality and visualise it. Some of the companies have already started to collect quality ensured data and need the tools to both visualise the data and to allow an easy approach to employ a rule-based pre-processing of the data. Only a few companies have already reached the level of maturity which allows them to develop, evaluate and deploy prediction models in live operations. These companies already need an IoT platform which offers them the full functionality. To satisfy all the different requirements of companies our IoT platform and our methodology are designed according to the CRISP process. 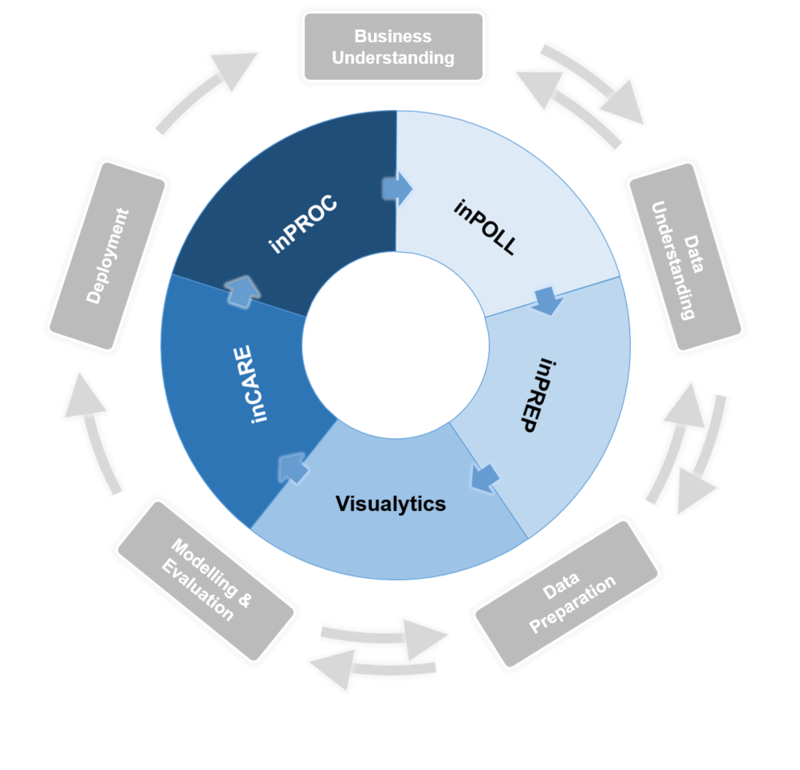 This enables us to offer a flexible solution which reflects the level of maturity of our customers beginning with a solution that collects and visualises data (“data understanding”) eventually resulting in a solution that offers full functionality for live operations (“modelling” and “deployment”).